Storm preparation mode. Haven’t had a stretch like this since 2008, at least that we can remember. That late summer, early fall we were coming off of a dry period just like this year when several tropical storms hit us in about a week and we had over 13 inches of rain over a two week period. 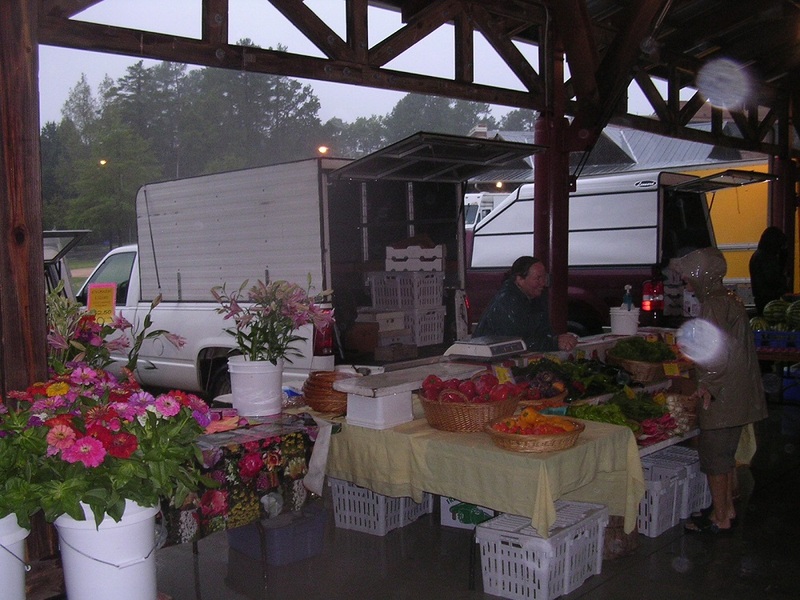 During the September 6th Saturday market, tropical storm Hannah arrived with high winds and 4 inches of rain. It shouldn’t be that bad this Saturday but it does look to be wet. Our first concern this weekend is the potential of the Haw River flooding our bottom field where the peppers are this year and part of the fall vegetables. With 4 inches of rain this past week the river is already up some and if we get hit with the high end of the 5-9 inches forecast it could be a problem. Fortunately we will be able know it is coming and will at least be able to pick a bunch of peppers and pull the irrigation pump if it gets that high. Our second concern is obviously the track of hurricane Joaquin, which yesterday looked like it was potentially on a Fran track but today looks to be trending further out to sea. As the last dryish day to get things done, we went ahead this morning and uncovered the last of the Big Tops and battened down other things in case the wind does really get up, better safe than sorry. Tomorrow looks to be a really wet day but we are hoping some of the forecasts are correct about less rain on Saturday. Of course you all will come on to market because it is the market’s Pepper Festival with lots of good things to eat. Like last week, we will bring the roaster to market but we will just have to see how windy it is. This is it for for the Celosia festival, we will for sure have some this week. A few Tuberoses. If you want roasted peppers this week, let us know by Friday morning and we will pre-roast here at the farm and have them ready for you on Saturday in case it rains like hell. Still a ton of Colored Bells, especially Reds. A fair supply of Corno di Toros. Still a bit light on Anaheims and Poblanos this week. Passillas, Jalapenos, Serranos, Cayennes, Picante Pimento in hots. Shishitos and Padrons slowing down quickly, for appetizers and other uses along and the Aji Dulces, the habanero without heat. More baby Ginger. Japanese salad Turnips and a new planting of Radishes. Green Onions. Yukina Savoy, a good fall green. Asian Braising or Stir Fry mix is back too. Spaghetti and Acorn Squash. Eggplant both the striped Nubia and the heirloom Italian variety. Cilantro.